Red Stripe is a lager-style beer brewed and bottled in Jamaica. Notorious for its 11.2 ounce "stubby" bottles and diagonal red stripe, Red Stripe lager has grown in popularity throughout the world since its inception in 1928. 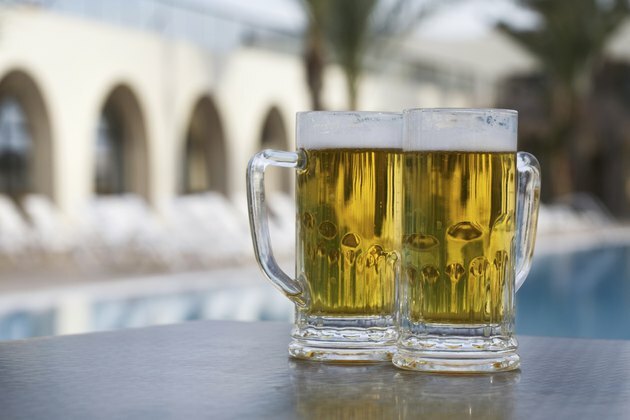 Lager-style beers such as Red Stripe are generally not considered to be beneficial to your health, although they do offer some nutritional value. Beer is generally made with either hops or barley and brewed with yeast. Red Stripe is a pale lager-style beer brewed from hops at low temperatures with a slow-acting yeast. Hops offer a surprising amount of nutritional value, including many essential oils. Yeast is a fungus that can be a rich source of nutritional value as well. The hops found in Red Stripe beer provide a surprisingly rich source of vitamins and minerals. Hops contain vitamins E, C and B-6. Yeast is a fungus that provides protein, folic acid and B-complex vitamins. Furthermore, Red Stripe beer contains antioxidants, which are associated with lower amounts of low-density lipoprotein, or the "bad" cholesterol. One 11.2-ounce bottle of Red Stripe beer contains 153 calories. Individuals require different amounts of daily caloric intake depending on a wide variety of factors, but healthy, active adults generally require between 1,800 and 2,200 calories per day, according to the National Strength and Conditioning Association. Unfortunately, the 7 calories per gram in alcohol have little nutritional value..
Carbohydrates are a highly digestible organic compound that provide the body with energy needed to perform basic functions. Approximately 60 percent of the diet should consist of carbohydrates, the National Strength and Conditioning Association recommends. A bottle of Red Stripe beer contains 14 grams of carbohydrate, which represents about 5 percent of the body's daily need. All 14 grams are in the form of sugar. Protein is essential for tissue growth and repair. Active adults need larger quantities of protein and the National Strength and Conditioning Association recommends acquiring between 15 and 30 percent of your total caloric intake from protein. A bottle of Red Stripe beer provides just 1 gram of protein and cannot be considered an adequate source. Further, protein from beer is an incomplete protein and does not offer the same nutritional value as that from animal sources such as fish and dairy products. Essentials of Strength Training and Conditioning; Thomas R. Baechle, et. al.